2. Leave a comment for us in the comment box below this post. We would love to know which prize you are most excited to win! JUSTSLIGHTLYVINTAGE has donated a beautiful rose quartz colored pair of earrings. ARTSYPAPERIESHOPPE has donated a mini pocket organizer to help you plan your day. CHILDREN'SCLASSICCOUTURE has donated a colorful set of baby wipes and a pair of children's overalls. Please be sure to visit these sites to see all they have to offer! 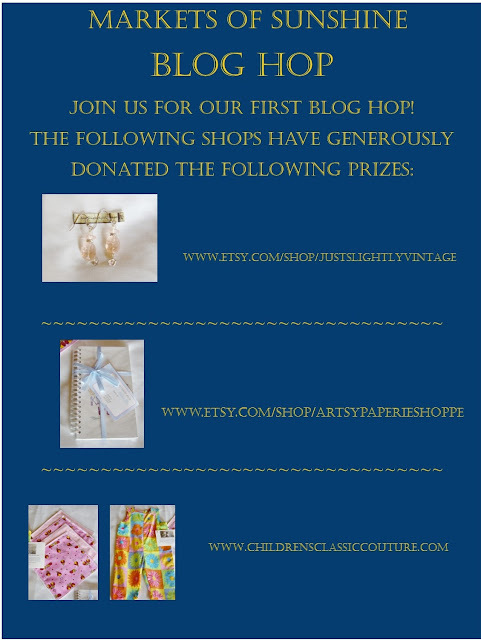 Once you have entered the drawing here, Blog Hop over to the next blog for another drawing! You'll find 4 more handmade gifts from MarketsofSunshine, Bloomingtailsdogduds and Childrensclassiccouture on the next blog. **Please Note: This Blog Hop is for residents of the Continental USA Only at this time. Entrants must be 18 years of age or older to take part. Prize package shown is what you will receive, no changes or substitutions. Winner will be contacted by email and the prize package will be shipped requiring signature from the winner. By entering the drawing, you are agreeing to the terms. I appreciate you stopping by today and hope you'll enter our blog hop. So excited to be doing this blog hop with you!! I hope everyone signs up and stops by to visit the shops that so generously donated these wonderful gifts. I hope I signed up correctly. I am still trying to figure this out. I love the blog hop idea. I would be most excited about the beautiful rose quartz colored pair of earrings. Yes! Kathleen you did it right. I received your VIP Sunshine Club membership. So, you are entered in the contest. Yeah! It's finally HOP day. I believe I'm signed up for the newsletter, and as to which prize excites me most, I have no problem loving them all!!! Thank you for this HOP. Thank you Lynda I am so glad to have you join the fun for our blog hop. I signed up in the club already. I would love to win the pink earrings and journal book. No kids yet. I do know several families I could gift the kids clothes to. Thank you Kayla for signing up and for sharing your excitement about the lovely prizes you'd like to win. I'm so happy to see this awesome Team grow!! Me too Sally. It shows we have something really valuable to share with those who sell on Etsy. I would love the mini pocket organizer. Thank you Julie for your comment. I did not receive your sign up for our VIP Sunshine Club. I need that to enter you in the contest. Thanks! Thank you Julie I got your sign up for our VIP Sunshine Club. You are now entered in the contest. I agree April, they are a lot of fun. Have you signed up for our VIP Sunshine Club? What item do you like best? Promoting for you Marsha on all our social media! Hope all goes well. Should be lots of fun. 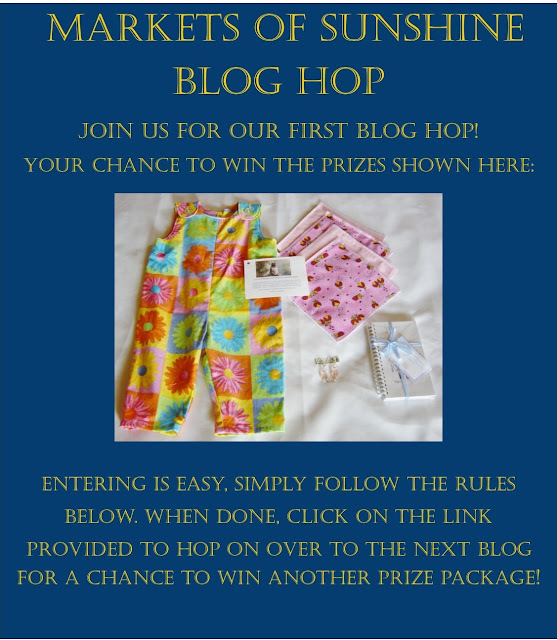 Thank you Candy for sharing our #Bloghop on your social media sites for us. You're the best! Thank you for entering our contest Misty. Looking forward to seeing who wins these great prizes. i love the little overall pants. Thank you Gretchen for entering our contest. Those little overall pants are so adorable. I can't wait to see who wins them. I would love to win the patchwork overalls. Thank you for the chance. Thank you Wee Princess Designer we have you entered. I have signed up and I'm most excited about the children's overalls! Thank you for entering our contest. Best Wishes! Did you sign-up for our newsletter in the VIP Sunshine Club? That is the final step to be entered. Wow! I am so excited!! !